It's safe to say my latest obsession is jackets. With sooo many sales going on, it makes you wanna snag every item that's 50% off. 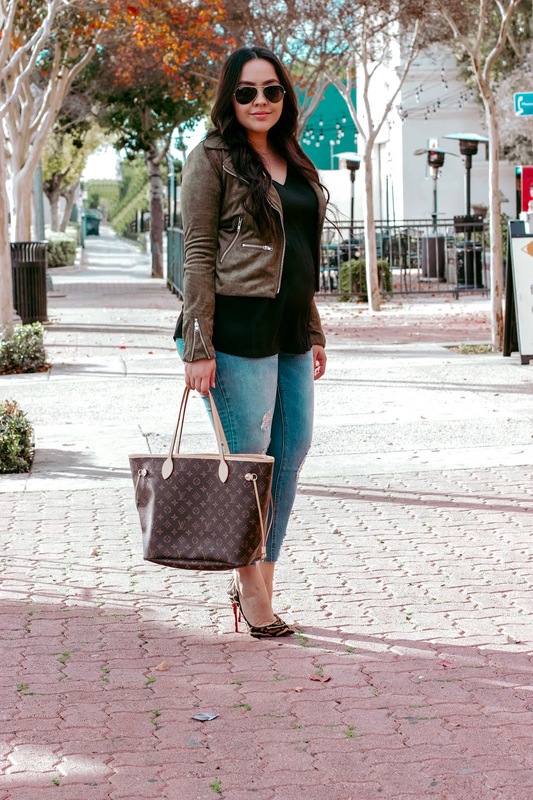 This faux suede jacket is super soft and lightweight, making it ideal for our "winter" weather in SoCal. I paired it with these skinnies, that just so happen to be maternity, can't even tell right? My whole pregnancy with Sebastian I refused, I used to think "pregnant lady clothes" were for older ladies and just not cute, so I practically only wore dresses and would go 1 size up or stick to my normal size if they were stretchy. It was easy because I was pregnant over summer and no one wants to wear jeans during that time of year anyways. This pregnancy, I noticed myself not fitting into my jeans way earlier, I'm talking 16 weeks early. I was at work one day and when I went to the bathroom to pull my pants down I saw the concealed hook hanging and the fabric had ripped. That night I went online and ordered maternity jeans, pants, shirts and leggings. To my surprise everything I found was super cute and on trend. I literally want to wear these jeans even after the baby comes, I just love the cut and color they're exactly what I've been looking for before I even got pregnant. What I also really liked is that they only have the side panel technically making them wearable post baby until I can fit into my old jeans again. This look is incredible from head to toe. Especially toe! I just love those heels.